The Donald Trump administration has read the Riot Act on the United Nations Human Rights Council. It has threatened to withdraw itself from the UNHRC, unless the council agrees to toe its line. The warning came through a letter Secretary of State Rex Tillerson sent to a group of nine non-profit organisations this week, according to an exclusive report posted on the prestigious Foreign Policy website. Certainly, the reforms the Trump administration is calling for are not aimed at making the UNHRC stronger. Washington apparently wants to make the council a rubber stamp, just as it has made the UN. 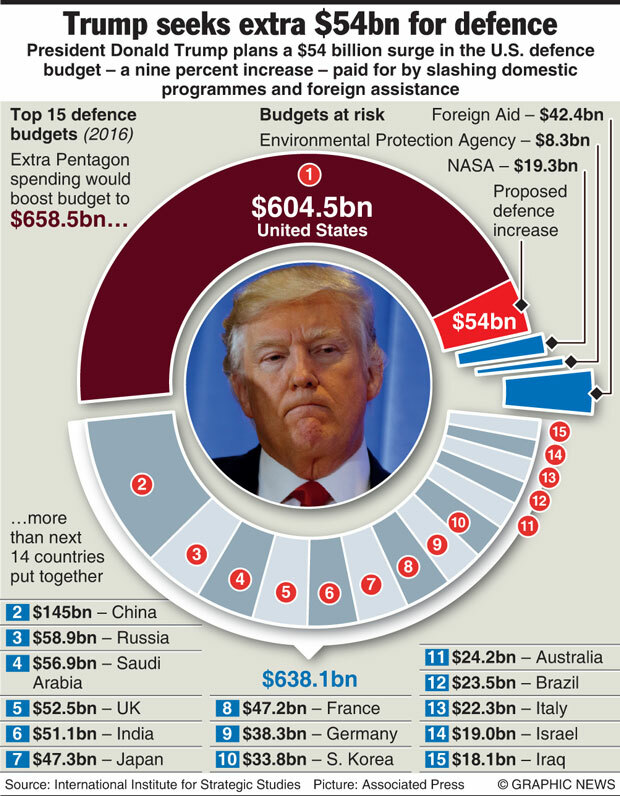 Or, the Trump administration is planning something more horrendous, with a US$ 54 billion surge in military expenditure. Successive US governments have been critical of the UNHRC. They have described it as an Israeli-bashing organisation. But at the same time, Washington has made use of the mechanism to put pressure on hostile nations. The US warning comes as no surprise because since Trump came to power, matters human rights have been pushed to the backburner. Perhaps he is forthright and does not want to be hypocritical like his predecessors – talking big about human rights and doing the opposite. Why blame Trump’s United States. Every big power is a human rights crook. In international relations, human rights remain politicised. Human rights are often seen as a hindrance to a state’s national security. Violations are justified on the basis that the survival of the state is more important than a citizen’s human rights. Human rights have become state-centric, instead of people-centric. This is why whistleblower Edward Snowden is refusing to leave Russia and surrender to US authorities. He fears that the US courts will uphold the power of the state at the expense of the citizens’ right to privacy and their freedom of expression. WikiLeaks’ chief editor Julian Assange is refusing to leave the Ecuadorian embassy in London to face justice in Sweden, because he fears that Stockholm, giving more importance to its relations with Washington than to its supposed commitment to uphold the people’s right to know, would extradite him to the US. When state-centric human rights are observed, citizens are told they live and die for the state – a subtle form of Nazism. When the rights of the state are considered greater than the citizen’s freedom, it is also militarism, a system where rulers, democratically elected or otherwise, invoke patriotism, glorify the military and enhances its capability to use it aggressively to defend or promote national interests. So much so that militarism supersedes liberal values. In the United States, both the Republicans and the Democrats subscribe to this unwritten doctrine. Militarism was evident during President Trump’s address to Congress last month. The Democrats, who by opposing Trump’s outrageous policies were posing off as champions of moral politics, shook their heads in disapproval when the billionaire-turned-President waxed eloquent on his controversial policies. But when he hailed the death of US SEAL William Owens during a raid on an al-Qaeda camp in Yemen and drew the lawmakers’ attention to his widow, members from both sides of the divide gave a record standing ovation. That the botched raid killed civilians was not a matter for them to worry about. That the US troops killed eight year-old- Nawar al-Awlaki, a US citizen and daughter of radical preacher Anwar al-Awlaki, whom the Americans extra-judicially killed in a drone attack in 2011, did not bother their conscience. That the raid was a violation of the territorial integrity of a sovereign nation was far from their thoughts. That it did not have the UN approval was the least of their concerns. So much for the US politicians’ commitment to uphold human rights and international law! The US commitment to human rights remains buried in the graveyard of political expediency, with the epitaph, among other horrors, mentioning the use of Agent Orange chemical weapon in Vietnam, depleted uranium on Iraqi civilians, the indiscriminate drone attacks on civilian targets in Afghanistan, Pakistan and Yemen, and Washington’s blind support for Israel to oppress the Palestinian people. What moral right does the US State Department have to publish its annual country report assessing other countries’ human rights record? Probably, Trump understands this. That may be the reason that the State Department did not have the usual hype when it released the human rights country report on March 3. Downplaying the event, instead of Secretary Tillerson, an assistant secretary of state presided over the low-key ceremony. It is interesting to note that, in an irony of ironies, China, which is usually named and shamed as one of the big-time human rights violators by the US State Department, has been hitting back at the US by publishing a human rights country report on the US since 1998. The latest report titled was released by the Information Office of the State Council, China’s cabinet, on March 9. It scoffs at the US for once again posing as the global “judge of human rights”. “Wielding ‘the baton of human rights,’ the US report cast blame on the human rights situation in many countries while paying no attention to its own terrible human rights problems. “With the gunshots lingering in people’s ears behind the Statue of Liberty, worsening racial discrimination and the election farce dominated by money politics, the self-proclaimed human rights defender has exposed its human rights ‘myth’ with its own deeds,” the report says highlighting concerns over gun violence, women rights and minority rights, among other issues. All major religions, for thousands of years, have been extorting their adherents to be just, fair and regard equality as a virtue. But it was only in the 19th century that slavery was abolished and only in the 20th century that civic rights of the Afro Americans in the United States were restored and apartheid was abolished in South Africa. Women were considered in most western countries as worthy of being given the right to vote only about some five decades ago. However, the golden era for human rights dawned after the Cold War between the US-led Western bloc and the Soviet Union-led Eastern bloc ended in 1991. The United Nations Human Rights Commission was seen as inadequate to deal with human rights violations and moves were initiated to form a powerful and effective mechanism under a new UN Human Rights Council. During this period, numerous were the European Human Rights Court’s decisions that gave more importance to a citizen’s rights than a member state’s action taken in the name of national security. However, the movement towards Eldorado suffered a severe blow when US President George W. Bush launched the war on terror in 2001. Torture was justified, privacy was undermined, and the Geneva conventions on warfare and prisoners of war were dumped in the dustbin. The observation of human rights became state-centric. Last year, the Brexit vote has enabled Britain to dissociate itself from the European Union standards on human rights. The rot continues.